There are times - almost always when I'm at home doing something so simple, so routine like putting the hens to bed, or turning off a lamp before going to bed - where I'm hit with a wave of happiness. It's as though things just couldn't get any better and whilst sometimes I greet this wonderful feeling with a chaser of "oh god, what's around the corner to send me crashing back to reality", I mostly find comfort in that fact that I can feel overwhelming joy in the most simple things of my daily life. This appreciation of the simple yet wonderful things comes with me to every photoshoot, so when I'm invited into people's homes to capture them, it's not just about a setting for photos. It's about documenting the little things that might just be triggers to their every day comfort and delight. I spend the first five minutes wandering the home, looking for these items - a calendar of events, a wall of family photos, a well worn book. The bits and pieces of home that in their own way, tell the story of family life. 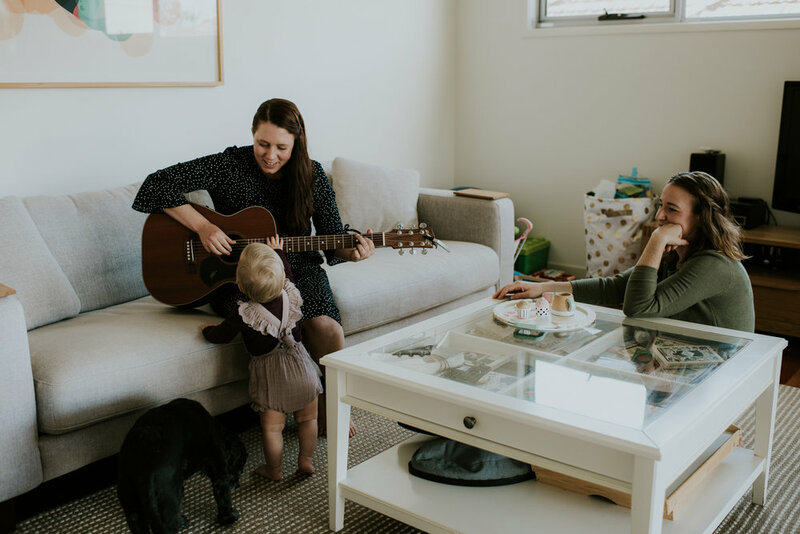 Recently, I was invited into the home of Amy, Jess and Addi. Last time I caught up with Amy, Jess and Addi was late last year, Addi being just six months old and together we explored one of my favourite nooks up at Whites Hill Reserve. This time round, I documented playtime, Addi having her favourite story read to her in bed, bubbles and song. 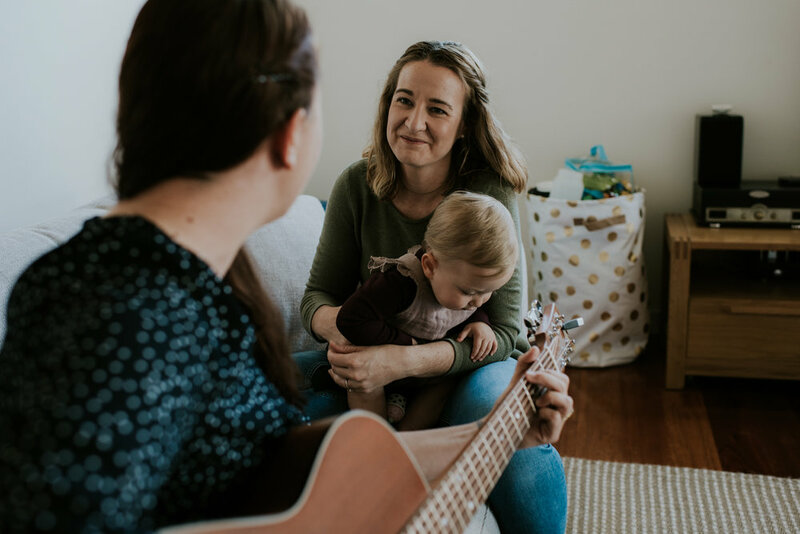 Amy picked up her guitar and sang which literally stopped me in my tracks and some of my favourite images from this session are those where Addi is taking in the beautiful sound of her Mums' voice. It's as though it fills her little body and overflows in expression in her face. Love and adoration is poured into this little girl who in turn is confident, independent and kind. Her mothers' love for one another is so deep-rooted, so apparent in the smallest and fleeting of interactions and the walls of this family home sing. Amy and Jess, thank you for welcoming me into your family home to capture all that is so routine but so priceless in your lives right now. I absolutely love sessions that take place in the family home. Candid, relaxed and 100% a reflection of who you are and how you connect with the people you love. If you'd love your family story documented in a beautiful, meaningful way, then get in touch today as I'd love to hear from you.